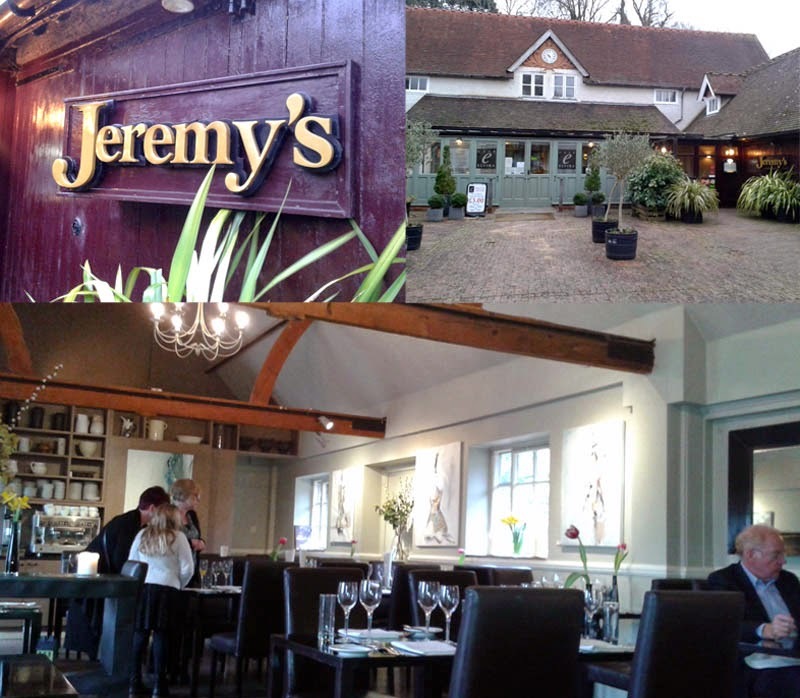 Jeremy's Restaurant is well known and established in Sussex, residing in the Borde Hill Garden estate for the past 18 years. It has been on my to-eat list for absolutely ages, but like most Brightonians, I get a little lazy when having to travel for food. To be honest, although I had heard positive feedback about Jeremy's, the mental picture I had was that of a very formal, traditional jus-with-everything food and a slightly stale environment in weekend blazers. But what I found couldn't have been further from my preconceptions. With owner and chef Jeremy Ashpool still rightfully in the kitchen, he now has a young head chef Jimmy Gray (winner of Sussex Young chef of the year 2013) to bring some fresh ideas and a modern approach to Jeremy's. This strikes the ideal balance of keeping a firm foundation in solid, classic cooking that champions the local and the seasonal but introduces inventive detail. Despite being just 26, Gray is some real talent and has clearly grown up with his own family ties to the restaurant industry. I've been to other in-the-middle-of-nowhere fine dining establishments that have become stagnant but investing in new talent will always keep you current and also attractive to a new generation of clientele. 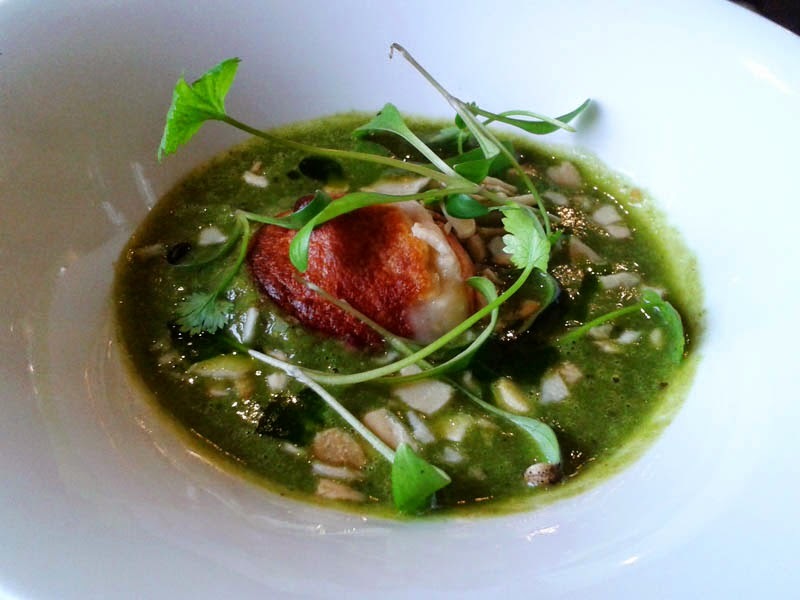 The amuse of spinach soup was a beauty to look at. Topped with a tiny, cheese filled wonton and given texture with finely chopped fresh radicchio, the soup was lifted with coriander micro herbs. Our starters reflected the clever classic/contemporary contrast I mentioned with a very modern plate of salt baked heritage carrots and a more grounded bowl of scallops in a crab bisque. 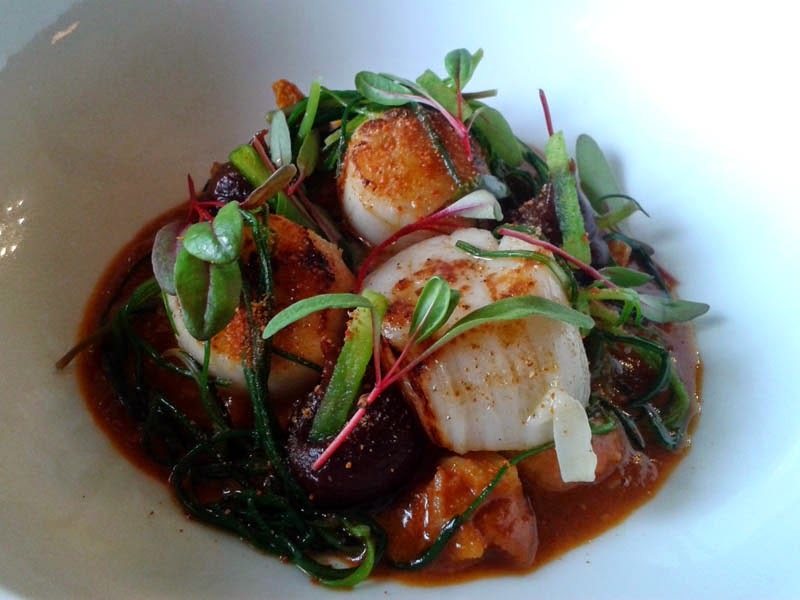 The scallops were plump, sweet and perfectly cooked as you would expect and sat in a rich, decadent bisque. It was nice to see monks beard for flavour and texture as well as apple for contrast. 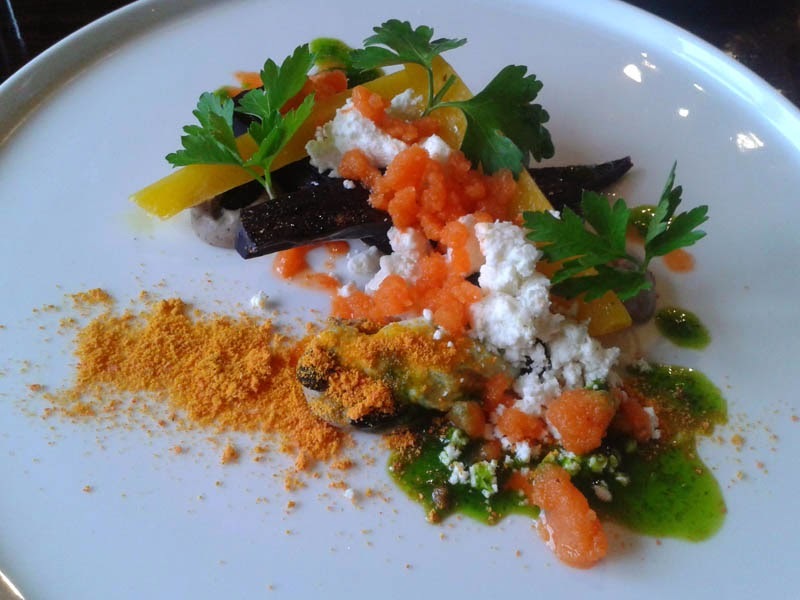 My jewel coloured heritage carrot dish was visually spectacular and had a lot going on. This seemed a bit of a wild card on the menu which always attracts me and the textures were really at play with a cold sorbet, smooth Slipcote cheese, firm black beans and a vanilla black bean puree. There was also a vibrant citrus dust. All in all a really experimental dish that whilst not entirely harmonious, was definitely one to remember. I also really loved seeing proper flat leaf parsley back on the plate. Personally I find it a really nice leaf to eat and a break from the micro herb trend. 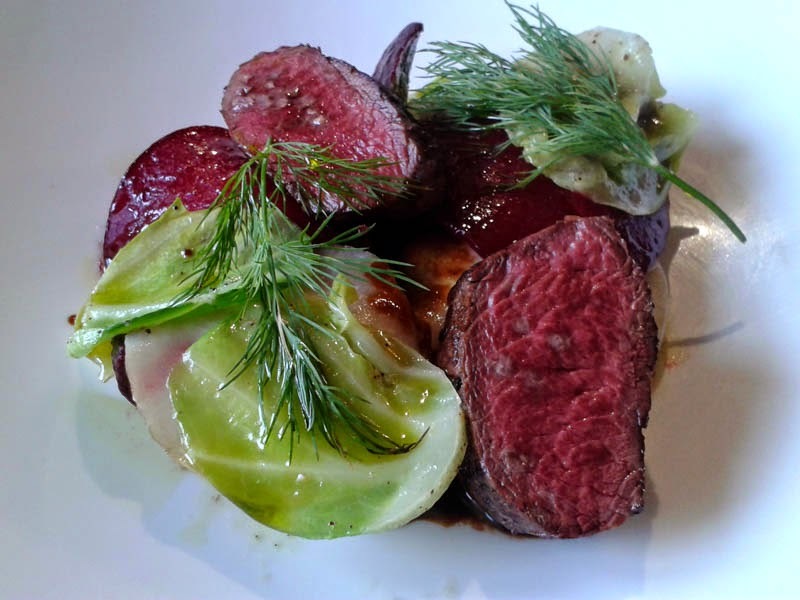 Beetroot and venison will always belong together in my book. Their earthiness go together so well and couldn't have been more pleased with my main choice. My worries about the chocolate sauce was unfounded, just adding a richness to the dish. The Balcome Estate venison loin was beautifully tender and the smoky venison sausage and meatball kept the dish interesting. This was such a gorgeous plate of food and I loved the visual effort of matching the loin shape by cutting the cabbage, beetroot and turnip slices into perfect rounds. 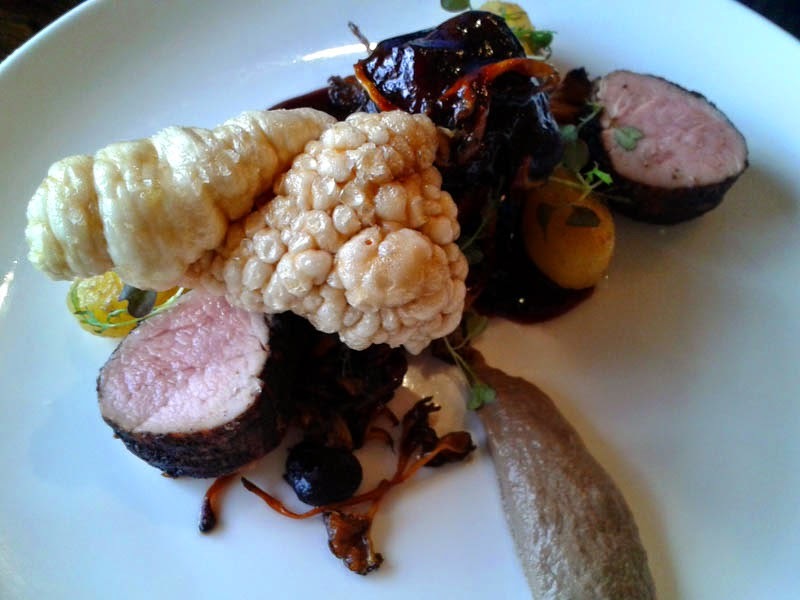 Equally, Mr GF was very happy with the tenderloin and confit belly of Plumpton pork. I was scratching my head at the strange shape on top of the plate, thinking it may be some obscure root vegetable I'd yet to come across but they had cleverly dehydrated then fried the pork crackling which made it puff up to the lightest, most airy and crispy crackling you will ever taste. Chefs seem to be dehydrating everything in sight these days which getting a bit dull, but when it's done to enhance rather than for sake, I'm on board. 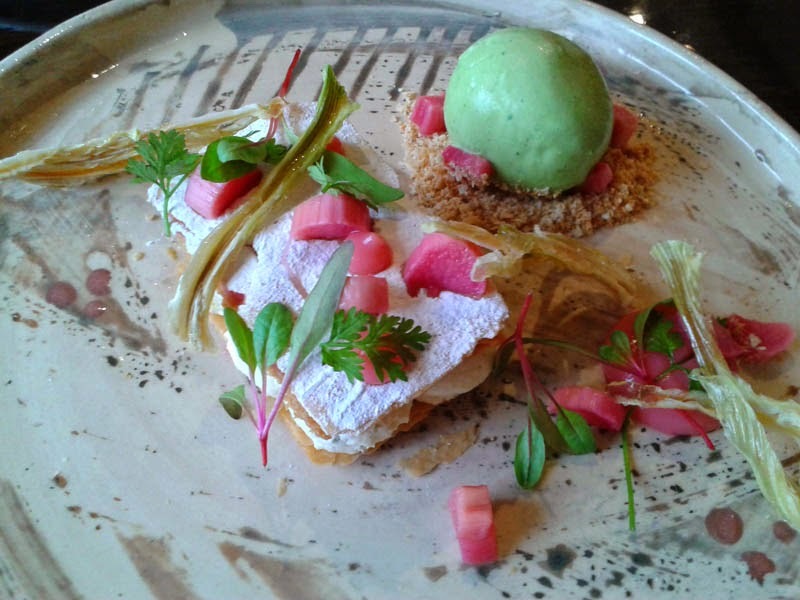 After such a stellar few plates of food, I was keen to see the desserts so chose a fresh rhubarb and stem ginger mille-feuille. Is this not the prettiest dessert you have ever seen (top image)? Now this IS a good choice of plate to enhance the food, we can clearly toss out all those naff slate plates now! The candied fennel was the element that added the sweet hit to the dish and was exactly the refreshing taste I wanted to end the meal (I'm not one for chocolate and sweetness after a meal). 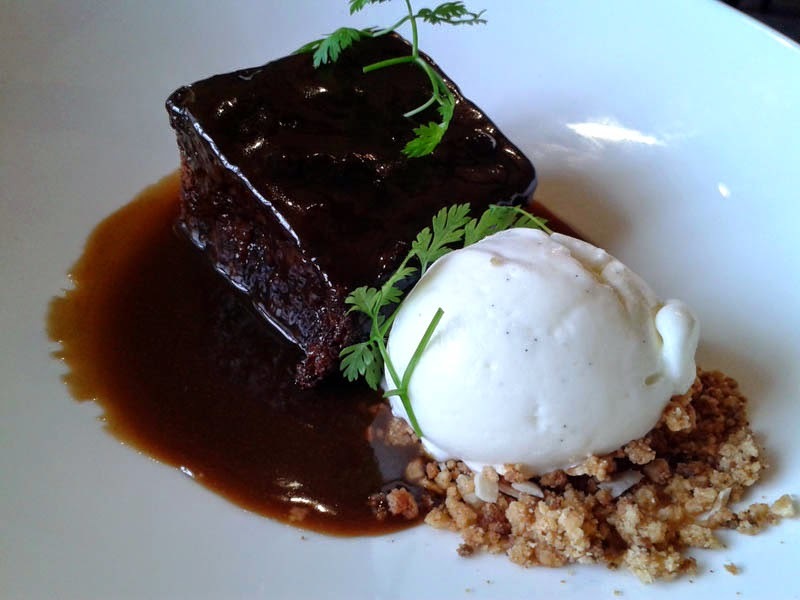 Mr GF may as well start a sticky toffee pudding blog. I swear that man must have had every one in Sussex. It's that boy's drug of choice! But again it was a great dessert and the tart buttermilk ice cream helped to take the teeth, tingling sweetness down a notch. I really miss smart, traditional service and still think there is a time and a place for it. At Jeremy's the waiting staff hit that formal yet friendly balance well. The whole meal was perfectly paced throughout. We ordered a la carte, but it's worth mentioning that there is also an unbelievably good value set menu available 2 courses £18 and 3 for £22 available Tues - Sat lunch and Tues - Thurs dinner. The wine list was varied and sensibly priced too. Although I was expecting a slightly stuffy environment and menu from my own preconceptions, the award-winning Jeremy's is a great modern restaurant in an elegant setting. It may have been around for 18 years but as you can see, there is still plenty fresh about it to warrant the trip up from Brighton for. I know it can be hard to go that extra mile for dining, especially for the younger city crowd, but sometimes it's really worth it. Jeremy's is just a short train trip and cab away from Brighton if you want to have a drink with your meal and in the summer the terrace overlooking the gardens is another bonus for visiting. There is also a more informal cafe next door (run by Vera Ashpool) which I popped into that has a nice outside space and would be great for children too. I dined as a guest of Jeremy's.